Rickie Fowler heads into the 2018 U.S. Open as one of the top favorites to win the second major of the season. Of the top 11 faves, he’s one of only two who has never nabbed a big one before, but the event is being held this year at one of his (and everyone’s) favorite courses, Shinnecock Hills on Long Island. Fowler’s recent history as maybe the best player in the game without a major championship is well-documented (maybe more well-documented than anything since Watergate), and I won’t dive deep on that aspect of it (mostly because I did so today for CBS Sports). I do think Fowler will win a major at some point, and I think it will be one of the Opens. Could it be this one? I think it could be, and here are five reasons why. Learning how to win (especially major championships) takes time. Justin Thomas and Jordan Spieth are the exception, not the rule, and the majority of major winners have been on the PGA Tour for five or 10 years before nabbing their first (see: Mickelson, Phil and Johnson, Dustin). The learning curve is long and arduous, and Fowler has seemingly arrived at the end of it. “I am ready to go win a major, but this was kind of the first major week that I understood that and known that and felt that,” said Fowler after the Masters. I believe that because I’ve seen it happen with player after player before him. Sometimes it feels like we talk about Fowler like he’s 37 years old and nearing the end of his career (i.e. Sergio). The reality? He’s 29 and probably just entering his prime. Shinnecock is legendary for its label as maybe the best championship course in American golf. Here’s how Andy Johnson put it on the Fried Egg. The undulating fairways will produce a bevy of uneven lies that, coupled with ever-changing wind directions, will make it excruciating to control distances. A shot one yard from perfect can mercilessly tumble 30 yards away. The severe nature of the slopes of the greens will test a player’s touch and also command respect and thoughtful approach play. Shinnecock Hills will expose any and all flaws in a player’s game. Fowler possesses all of the shots (more on this from Rory in a minute), and while he’s tumbled a bit this year, he normally finishes in the top 10 or 15 on the PGA Tour in strokes gained overall. I especially love that he ranks in the top 10 on the PGA Tour this year in scrambling because he’s going to have to get up and down from all over the yard after Shinnecock (or the USGA) removed all the rough from around the greens. Fowler is not necessarily built to win on a bomber’s paradise, but when you, as Andy said here, turn a math problem into a complex riddle, Fowler emerges as a prime candidate to be the one who solves it. I’ve been critical of Fowler in the past for not understanding the rhythm of a 72-hole event. He doesn’t giddy up when he needs to, and as a result he often gets left in the dust. You need not look past last year’s U.S. Open to see that. Fowler led after the first day, but Brooks Koepka blew by him like James Washington playing Tulsa. Fowler’s patience and discipline might be rewarded this year — this is part of why I’ve always thought his first major would come at an Open. The winning score at Shinny is likely not going to be double digits under par, and will almost certainly be closer to even than 10 under. The last three winning scores have been 4 under, even and 1 under. Also, the wind will probably blow and a pinwheel-like course setup in potentially breezy conditions should play nicely into Fowler’s hands. 4. Best on Tough Tracks? To go along with point No. 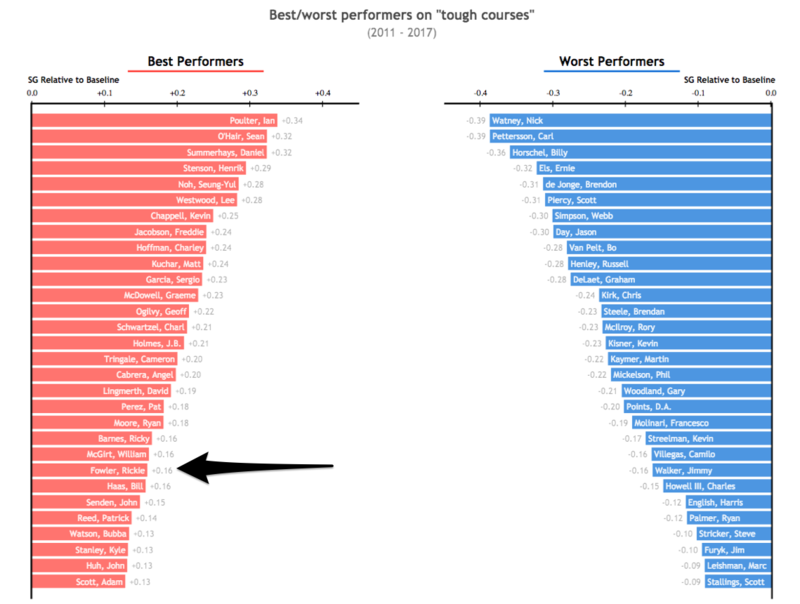 3, Data Golf recently looked at who plays the best on tough courses since 2011. Fowler’s name, was unsurprisingly on the good side of the ledger. Here’s a look. Here’s what Ben Coley added in his spectacular Sporting Life preview. Less speculatively, Fowler’s two best Masters performances prior to this year were followed by contending in the US Open; indeed the only time he’d previously bagged a top-five at Augusta was 2014, the year in which he went on to take second at Pinehurst and again at Hoylake before hitting the front during the back-nine of the PGA Championship at Valhalla, ultimately finishing third. Throw in the fact that he plays tough courses well, grew up on poa annua greens and will carry huge support among the passionate, noisy New York crowds, and everything is in place for a man who is undoubtedly good enough to get the job done. Hard greens Fowler has had success on? A variety of decisions and lines to choose from? There’s a reason he has three top 10s in his last five Opens. Finally, four-time major champ Rory McIlroy weighed in on Fowler, and it sounded like he was considering putting a few Euros down on Big Rick after he got in a very subtle cut about 2014. “I’d be very surprised if Rickie didn’t have multiple majors by the end of his career,” said McIlroy on Wednesday. “He’s a great player. Again, he’s played great in majors. Like he could have won a couple in ’14, and I was the one that got the better of him there. “He’s put himself in positions. He made a great run at Augusta earlier this year. Again, it’s just there’s so much more to winning a golf tournament than just playing well. Your timing has to be right. Things have to happen at the right time. You have to get momentum at the right time, a lucky break here and there. The more times Rickie puts himself in a position, the better his chances are of winning one. Obviously anything Rory says is concrete gospel truth in my world so I paid attention to a lot of imagination and all the shots. You might even say Phil Mickelson-like, but from the right side. Lefty finished top five here in 1995 and 2004, and I think Fowler is going to do that or better in 2018. The post Five Reasons Rickie Fowler Will Win the 2018 U.S. Open appeared first on Pistols Firing.